Our old neighbour is the Fashionista Sista, and I’m thinking that some of her aura of stylishness has rubbed off on us because, a few weeks ago, Grant and I were invited to sit front and centre at a fashion show. Yes, a fashion show. With models and a runway and everything. Such fun! But, before people start posting comments about the consumption and excess of the fashion world, let me say that the reason we were invited was that the show was all about upcycled clothing. The event was the brainchild of Sayan Sivanesan. We first met Sayan at one of our screenings, and he was so excited about sustainability, we could tell he was going to do some amazing things. Sayan is a business student who recognized that for many people, there is a serious social stigma to buying used clothing. For a large portion of the population, it’s just not “cool”. In fact, when he surveyed people at the Sauder School of Business, he found that most of his peers never shopped secondhand; they thought thrift was either for poor people or was about low quality clothes. That inspired Sayan to start a movement to make secondhand clothing go mainstream. If the fabric is not usable, it goes to textile recycling. If the clothes are of excellent quality and tailoring already, they are embroidered with a red feather logo and included in the “renew” line of clothing (which is equivalent to your standard Value Village type thrift store type pricing). If they are good fabric, but need some altering, they are given to in-house artists who take them apart and put them together into a new, one-of-a-kind piece that is part of the “rebirth” line (think $45-200 for handmade gems) before being embroidered with a red feather logo. 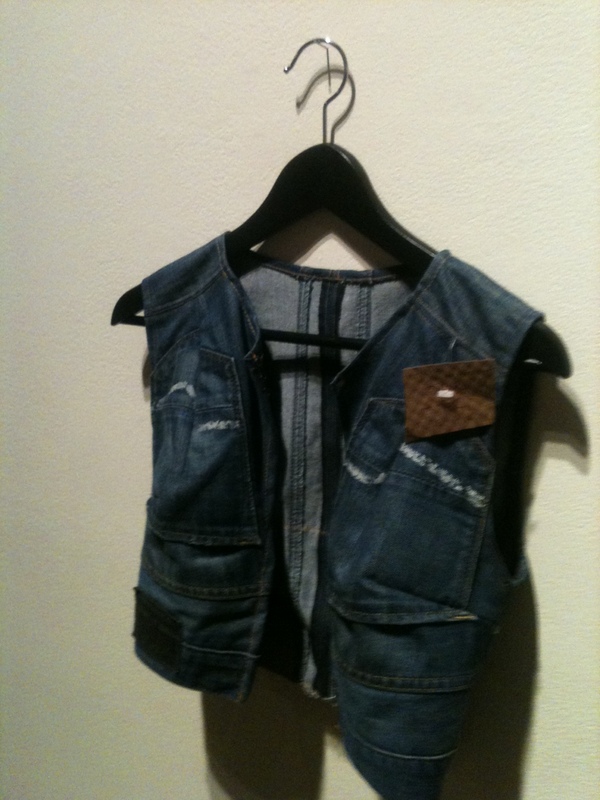 This perfectly tailored, upcycled vest made from an upside-down pair of jeans was one of my favorites. The red feather is the official RISE logo. Based on the concept of a Phoenix rising from the ashes, it’s a subtle symbol that the garment has been upcycled, reused, or reborn in some way. In addition to feeling like minor celebrities (Sayan got us front row seats at the cat walk), the event was really fun. After the show, people could walk around and look at clothes in a gallery type setting and try them on and sip cocktails. It definitely felt more upscale than your standard Sally Ann, but we still walked away with a nice tailored shirt and salvaged skirt for just $20. I like to think that if I was wearing my skirt, and I saw someone on the street who also had a red feather logo, we’d exchange a secret knowing (and extremely fahionable) look before continuing on. . . In any case, RISE just launched their new website, so keep your eyes peeled for red feathers out there! This is a great idea because it takes clothes nobody wants and turns them into fashionable items which conserves materials and is good for the environment! Every time I wear the skirt I got on that day, I remember that it was saved from a landfill by someone who cared about reuse.